The Monster slakes its thirst, catching a first glimpse of itself in a stream. 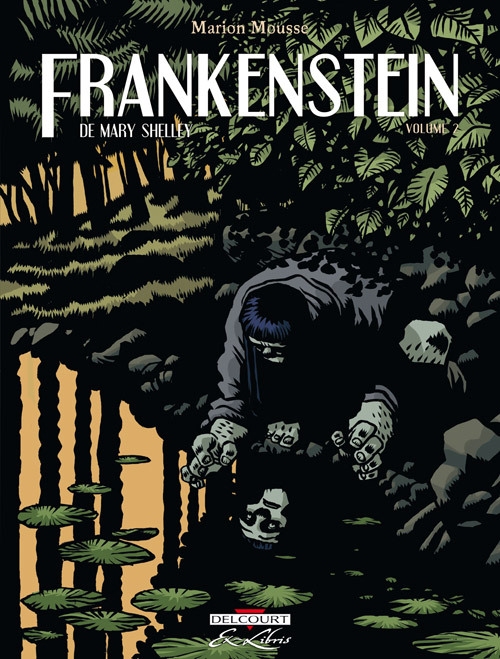 I’ve blogged about Marion Mousse’s French-language graphic novel adaptation of Frankenstein previously, and Volume One of the trilogy made my Top Frankenstein Events of 2007 list. Here’s a first look at Volume Two, coming out January 23rd from Delcourt of Paris. There are five pages of art previewed on the publisher’s website. Click the small arrow under the cover to see them. You can also click the cover of the first volume to see sample art from that one. As I’ve said before, this careful, intelligent adaptation deserves an English translation. Pierre, that's just beautiful. And even more important, just feels "right." How can we lobby for an E.L. version? I take it there isn't an English version! Bummer! This looks amazing.